The thing is that I’ve been having to function under increasing levels of stress for the past two years, and I kind of reached a breaking point over the weekend before last. The funny thing is that I’m actually not as stressed this year as I have been for the past two, but at any rate, I haven’t been in a place where I can honestly say that I can truly breathe easier in the past two years. This is going to be hard to say. Anxiety is a real thing, and last Wednesday was that thing raising its head in a way I hadn’t experienced in years. I think it was a build up of little things that kept growing and growing until one extra little thing made me feel like my whole life was getting wasted and that I’d be trapped watching said wastage taking place forever. The good thing about all this was that this particular freak-out meant that I woke up to the need to evaluate my life and see where I can smooth things over in order to maximize the odds of me breathing easier in the near future. So. What this means for me is cleaning up house, so to speak. Which mostly centers around me using the three public holidays I have (one on this past Monday and two on Easter) to do a ton of things I’ve wanted to do that I kept putting aside for other stuff. It’s not necessarily a nice feeling, because right now, I’m feeling like I’m in dire need of a vacation. So in between, I’m taking plenty of breaks and doing things I enjoy. But overall, the idea is to give myself fewer things to worry about, so I can deal with the big stuff more efficiently later. But yeah. That’s where I am at the moment. How are you doing? Do you also take time to evaluate and adjust? How do you deal with pressure? Yeah yeah. I know. It’s August and I still haven’t finished April’s A to Z Challenge. I’m getting there, though. Which actually brings me to the whole point of today’s post. Since I define writers as people who are writing, (as supposed to people who say “I have this great idea, but I just don’t have time…”) this relates to actual writers having time. More specifically, I want to point out that writers very rarely have any time to spare. We never have enough time to write enough. And when we do, we don’t have time for anything else. It’s a curse, I tell you. It is, however, quite normal, and you needn’t feel guilty about it. Nor should you feel guilty when you steal time. Or when you make time, be it to write or not. You’re writing. Even if it’s only a small bit at a time. You’re writing, and that’s the important thing. What’s your relationship with time like? IWSG: Time… oh the time…. Before I start on today’s post, I just want to ask that you check out yesterday’s announcement. I’d love it if you took part! 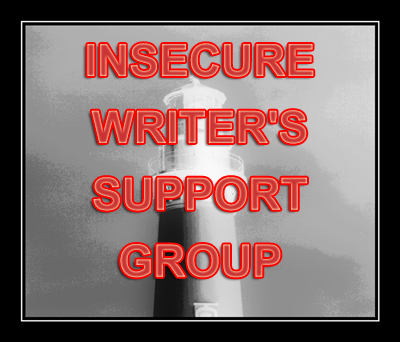 Okay, so for those of you who don’t know, the Insecure Writer’s Support Group is a monthly bloghop where we writerly types come together and share our insecurities and encouragements as needed. The awesome thing about doing this is that, if nothing else, we realize we’re not alone in our troubles. Better yet is when we get some tips or advice that actually make things better. Anyone’s welcome to join. Just click here. See I want to release three books at the end of the year. Two in October and one sometime before the end of December. And as lovely as this sounds in my brain, I can’t believe that so much of the year has whizzed by. Point is, the only writing goals that stand a chance of getting done are getting those three projects ready and published. I made the call of cutting myself some slack on editing, I know, since I’d been spinning my wheels for months. The thing is, there’s only so much slack left before I miss my deadlines. Ugh. Anyway that’s the niggle that’s growing into more and more of a worry as I write about it. So now I’m just going to stop. Anyone else feeling keenly aware of the year slipping away from us? I’m not quite where I want to be with my editing, but that’s fine. I’m finally getting back to working office hours at the day-job. Today, though, is a bit of a tough one because of the cake decorating course I’m taking. Don’t get me wrong. It’s fun and really interesting. But the classes are long and often require more intense concentration than you’d think. So tonight… I’m going to kick back and not feel guilty. I don’t need to, because tomorrow’s South Africa’s presidential elections, which means the whole country shuts down (again). Good for me because it’ll probably take me a few minutes to vote, and I’ll have the whole day to edit. So I can still finish The Vanished Knight‘s edits by tomorrow. Just not by forcing myself to try and edit tonight, and then not concentrating which means I have to redo it all again tomorrow. Sometimes, it really is more efficient to not work at something. Anyone else editing? How’s it going? I can’t believe that we’re at the end of April already. Because it’s the last Friday of this month, it’s Update Day for my bloghop. Basically, we’re just a group of people with some big, crazy or even crazy important goals, and once a month we get together to update everyone on how we’re doing. Please feel free to click here for more information. Mmm… drafting wise, I’m yet to add any significant amounts of words to my projects. I pretty much spent half the month being too messed up to write (because of the dispute I had going on with my publishing house), and the remainder recovering from being messed up. I did write quite a bit, though, but nothing related to my goals. However, I did finish editing Birds vs Bastards and my short story for the Untethered Realms anthology. So I can’t really say I achieved nothing. I’m glad for that, because two months of being unproductive would just have been depressing. But speaking of depressing. I’ve had to take a nice long look at my timeline for this year. Basically, the four months being f*cked around by my publishing house means that I’ll basically be able to achieve almost nothing of what I wanted. I understand that I had set steep goals and I was never going to get everything done, but… I would have liked if the four months of nearly blank squares everywhere was due to me say… doing something fun like catching up on series or work (yep, I love working on the farm) or anything else of that sort. But… no. Mainly the reason why I did almost nothing was that my mind had been put through the blender, and my emotions wrung out by my publishing house. I’m going to have to edit book two in my War of Six Crowns Series (Wo6C2) in June, when it was supposed to be finished already. Which means I can’t even rewrite Wo6C3 until much later this year. Which means I can’t even start writing Wo6C4 at all. It also means that none of the books I wanted to finish drafting by June have even truly been started yet. And that means that the second batch of drafts I wanted to do this year is postponed to the last four months. Rewrites? Half of them had to be postponed until next year just so that I can get my priority projects almost done. So yeah. I’m NOT a happy camper. Not by any stretch of the imagination. Right now, I’m just hoping that things’ll fall into place easily once I get back into some sort of groove. Right now, that’s the only chance I’ll have to achieve any except for one of the goals I set for this year. Who knows? It could happen, right? The lucky thing is that my $7500 goal is only deadlined for 2018. So anything I get done this year still goes towards that. I just HATE that it’ll be such a measly amount.